The Best Restaurant in Salem, Oregon! Come check out our spacious indoor and outdoor seating! Come for the food. Stay for the great service, friendly decor, and a round of mini golf! We're located on Commercial Street just south of downtown Salem. Get in touch! Play 18 holes of miniature golf! More than just great steaks… great food and great times are waiting for you and your group at Best Little Roadhouse restaurant. If you live here or are just passing through and looking for a great restaurant in Salem Oregon, stop in for an incredible dining experience. Delicious food, fun family atmosphere and miniature golf are served up with enthusiasm and style. It all starts with a smile and ends with a full stomach and the anticipation of your next visit. Your meal begins with incredible, mouth watering rolls hot from the oven. Then it is followed with amazing steaks, fresh salads, juicy chicken and more. Check out all our menus and then come on down. 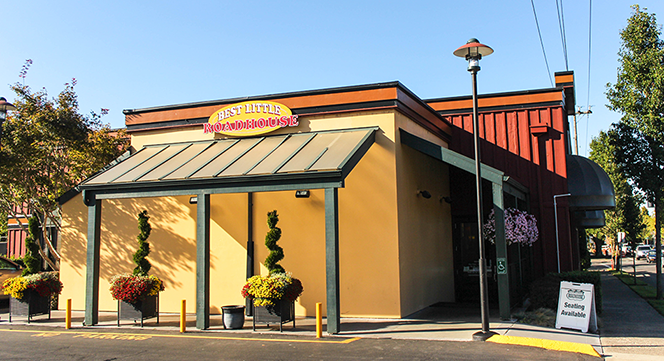 You will see why Best Little Roadhouse restaurant was Voted Best Steakhouse by the readers of The Salem Statesman Journal! If you are looking for a night out, our bar offers fifteen beers on tap, a robust wine list and who can resist our daily drink specials, especially $4 martinis on Thursdays! What are you waiting for? Come indulge yourself with an awesome dining experience, remember it all starts with a smile! Salem Oregon restaurant, steakhouse, and more.